A fast-growing Climber, related to Nasturtiums, with exotic lobed leaves and an abundance of yellow frilled flowers. Plants climb up to 3m in one season and spread over 1m across. The lovely frilled flowers come out from June to September/October. Great plants for a fence or wall or for climbing through shrubs or other climbers. They look good in hanging baskets. 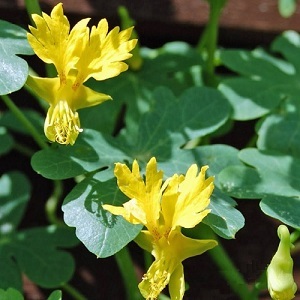 The Canary Creeper grows best in a sunny spot and not-too-rich well-drained soil. Pack of 20 seeds. Sow indoors in spring and plant out after the last frost. 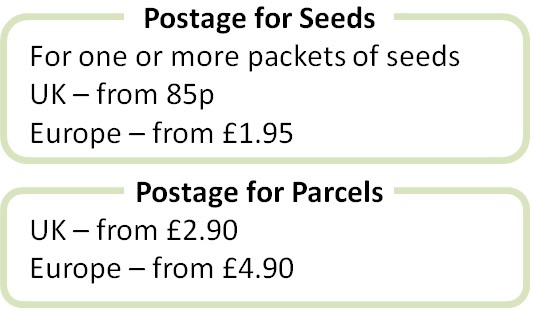 Seeds can be direct sown in late May, but only in a warm spring, otherwise they do better starting earlier indoors. Sowing instructions and a colour photo are printed on the packet. Sow in spring from March to May in small pots of compost. Keep at 15-20°C and germination takes 1-3. Pot up and grow on until ready to plant out into the garden or containers in a sunny spot after hardening off and after the last frost. Protect young plants from slugs. Grow Provide support for these climbing plants or encourage them to climb through shrubs and other plants. Do not over fertilize plants as this can favour growth over flowers. Plants are killed off by the frost, when they can be removed. Canary Creepers can be grown in a conservatory, as they are natural perennials. In warm Mediterranean gardens, mulch the plants around the roots in winter and they will grow as perennials.